YouTube does not allow downloading its video – of course, you can find some tools to make that happen but they just won’t work on certain videos (like VEVO videos) or after YouTube’s upgrade. YouTube music are all in video format. 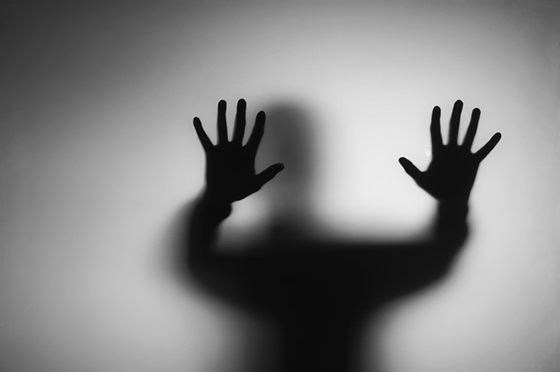 Even for those songs with no video content, the uploaders have to convert them to video format first – sometimes they just add some pictures of the artist or images of the lyrics. So even if you successfully download the video, they are in a video format instead of MP3 audio format. If you have already managed to download the YouTube music you want, congratulations! You are just one step away from playing your music on your cellphone or portable player. Just convert them to MP3 with All2MP3 for Mac, which is an easy, fast and completely free MP3 converter for Mac OS. It can convert any audio to MP3 and convert the FLV, M4V, MP4 or some HD and 4K videos you download from YouTube to MP3 audio files. No matter where you get your videos, just convert them with All2MP3 for Mac if you want only the playable version of them on your audio player. Download and install All2MP3 for Mac. Launch All2MP3 for Mac and drag the YouTube music you’ve already downloaded into the program window. You can also drag other video files in to extract the audio. Choose the output quality using the slider below. Change the output path if needed. Hit “Convert” to start the conversion. 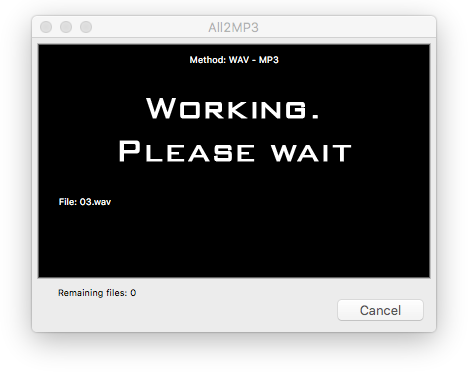 In a while, the MP3 versions of the music video files you input would be saved in the output folder. Have fun! If you haven’t downloaded the YouTube video yet, we recommend our AllYouTube2MP3 for Mac, which can directly download and convert YouTube to MP3. Meanwhile, it can also download video from other video sharing websites. If what you want is only the music video, you can download the video without converting them. 1. Copy and paste video URL. There is a blank box of “Paste Your Video URLs below” in the program window, copy the video URL from the website and paste it in the box. For more than one URLs, just paste them in the box but one per line. 2. Choose an output format by clicking on “Options” and go to the “Audio” tab. Check the box of “Convert to Audio” and you can find a list of audio formats in the menu of “Audio Format”. Then, choose “mp3” here. 3. Start video to audio conversion by “Download” button. During the process, you will see some info including title, extension, size, percent, ETA, speed and status. Like we said, some YouTube videos cannot be downloaded no matter which YouTube downloader you use, online or offline. What can you do about this if the music you want can’t be found anywhere else but YouTube? Ask for help from an online YouTube music recorder. Google “online audio recorder” and you will get plenty of results to choose. If you have installed an audio recorder on your Mac, you can also use it to record the stereo. Obviously it is the dumbest way to get YouTube music but under some circumstances, it is the only way. 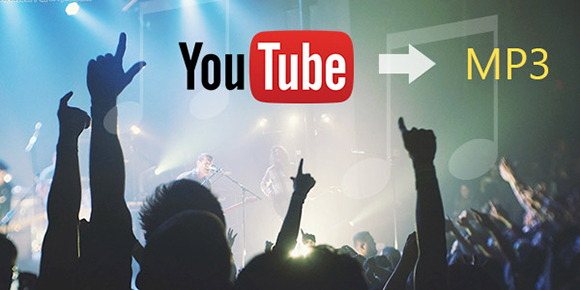 YouTube provides us a lot of fun and with the methods stated above, you can have even more fun without staying online. Convert YouTube to MP3 and bring it along on your portable devices. Music is just a start – you can find more interesting things on YouTube to turn to MP3: movies, TV series, audio books, news, etc. 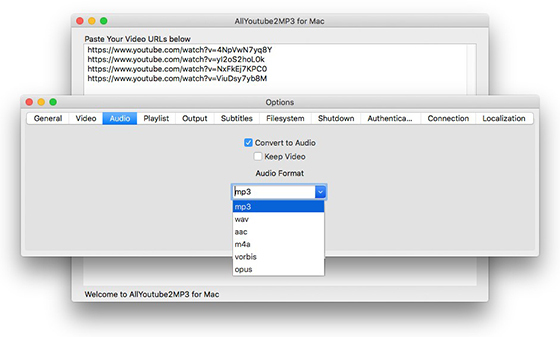 Download our Mac audio converter software or Mac YouTube converter software to have them all.